I sat, transfixed to my chair, wondering what the hell they were doing in the kitchen. Occasionally there would be a giggle and then an acrid, fishy smell would waft over me. 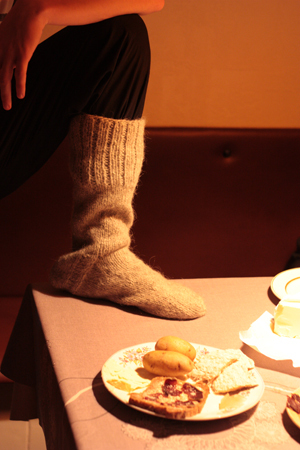 Did you know that from the 16th to 18th century the Faroe Islands were actually famous for their knitted wool socks? Their primary export even. Amazing. Anyway, my wonderful hosts had prepared a, um, fantastic platter of national delicacies. The sock was an added bonus I thought (but was not to be eaten, apparently). Here are the delicacies in more detail. With labels! And here’s a close-up of the wind-dried, rotten sheep (skerpikjøt) and whale blubber (spik). Yum . . . So, as I sat there chewing, enjoying the sheep, my host insisted on telling me a story about some family that had died eating the same dish a few years ago. Only after I’d had about 10 pieces of course. Apparently, if you accidentally put it in a bag, a deadly bacteria develops that then kills you within 12 hours. I pressed him for more information but he had none to give (I’ve JUST been told as I write this that it was botulism… insert nervous laughter here). He assured me that the skerpikjøt that was now sitting in my mouth, my face frozen into a rictus of terror, had never been placed in a bag. Are hallucinations and delusions of grandeur the first symptoms of bacterial infection…? The skerpikjøt (dried sheep) was actually rather nice! A lot like Parma ham/prosciutto (which I think is the same deal?) I ate lots of it. 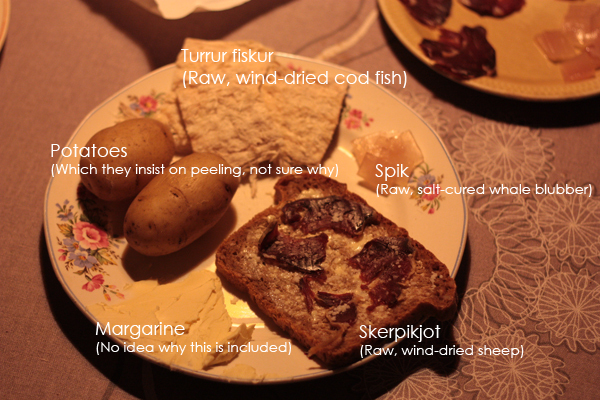 Turrur fiskur (dried fish) is… interesting. It’s completely dessicated; totally dry, very crumbly. But really odd — it’s a completely different texture to normal, wet fish. Not how fish should feel. The flavour was fine (it’s just cod), and it’s not like it was offensive in any way… just very odd. Whale blubber. Oh whale blubber… spik… wobbly, fishy, salty blubber. It’s not good. Maybe if you like chewing big lumps of fat you’ll like it. I’ve never liked chewing fat — I can just about do it if it’s fried or well-cooked but this is raw. Salted and cured in large chunks and then cut into small pieces for your chewing pleasure. I managed one piece and then almost threw up. Again, the flavour wasn’t particularly bad but the texture. I think there’s some other whale blubber variants that I can try but I think I’ll pass on those. Also, I’d like to try wind-dried whale meat but that’s very hard to get at the moment. Hopefully some more photos to follow tomorrow. If the weather improves! Ach, a wee blog outage! I am getting an image of Dog chews.. you know the ones. And slices of lard. And.. The sheep meat looks more like Bressola. Small comfort. It was certainly chewy. And fishy AND salty. Wow. You are a brave sir. You know, ever time I hear about a new set of delicacies, I realize that I am most certainly not adventurous with food. However it was very educational, and I applaud you for sharing. Oh my god. You are one BRAVE BRAVE soul. Hahaha. When I was living in Germany, I was told that I should try “Rollmops” Aka, Pickled Herring. Being from the Western US, my fish eatting habits range from nothing, to nothing. (Ok, a little Salmon, Trout, and if I’m wild I’ll pick up some shrimp at the store!). The Rollmops made me want to hurl. I tried it again about 8 months later, and it wasn’t SO bad, but still. Hahaha. 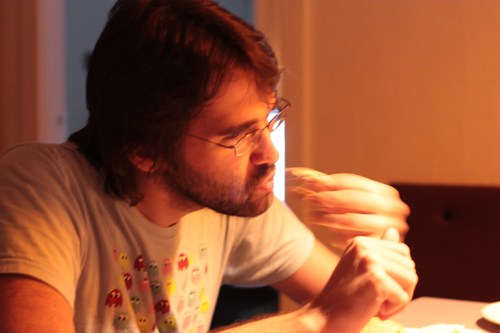 I tried the Dutch equivalent which isn’t pickled — simply raw herring covered in onions. At least it wasn’t FISHY as such. It’s just the damn texture that I can’t do. I hate foods with odd textures. I guess that’s more what people mean by a taste ‘growing’ on you — when you’ve had fish and meat cooked for 25 years, the raw texture is rather, um, interesting. Glad ya liked it, Renee! You are so brave honey, I would not have been able to eat any of it… well the potatoes would be ok I spose…. and I WARNED you about the sheep stuff. Well you seemed to have survived, luckily…. You are looking a bit thin! Great idea! I’ll see if I can find some nice ones. Ew. I wouldn’t have eaten any of it. Fish scares me, and meat that hasn’t been cooked thoroughly scares me even more. Ew, I don’t think I would have liked the whale blubber, either. Not a fan of animal fat in general. Good for you for trying! Did you notice all of the locals eating these things and enjoying them? Or are some of these foods just used to torture tourists? I am highly impressed with your culinary open-mindedness. The whale blubber looks like it would taste exactly the way you described. You are a brave, brave man. Yes Art, the blubber was Poseidonic karma sent from the Leviathan-riddled depths of the Atlantic to haunt me for ever more. 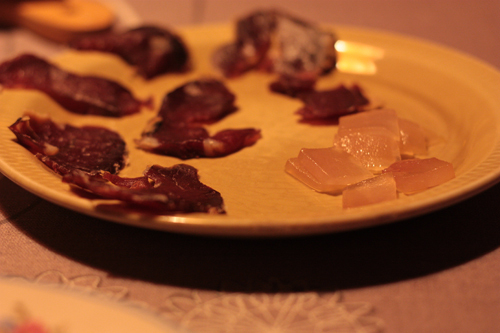 I think the dried fish was actually the weirdest food — at least with the sheep the texture was fairly regular. And the blubber, it was bad but no worse than I expected. The fish was just WEIRD. Like… crispy and chewy and flaky all at the same time. Eleni — one of them ate the blubber with reckless abandon. Another ate blubber for the first time (with me). Two others simply shook their heads and said ‘Nooooyyy’ (No). I think, as with most delicacies, the term usually implies ‘rarity’ rather than ‘tastiness’. You have to eat it because a) it’s of high value and b) you don’t know when you will next get some! The sheep looks quite appetising well done for trying it all! I fail to understand why everything is raw and wind-cured. Don’t they have Betty Crocker recipe books like everybody else? Seems to me they should invest in an oven. Or at least a stove. The socks, however, look lovely. I sort of want a pair. Because most of it was caught at sea, Kali — they then had to prepare it out there, or it’d be rotten before they got home! I think historically sailors would salt it… but obviously, wind-dried is probably a bit tastier than dunked in barrels of salt. As for the sheep, again, you have to cure things if you want to keep them for longer than a few days/weeks. When the only food you have is fish and sheep (and some potatoes), I guess you have to find good ways of having food for the rest of the year — thus the curing! They smoke stuff too, but wind-drying seems to be more popular. It certainly tasted rather nice! Margarine is mixed with hot potatoes and it melts and it becomes like sauce. Is this a totally alien concept to you? I never peel my potatoes either but many prefer them peeled in Scandinavia. Good god, the blubber! I’m practically sick just THINKING about it! (But then, I get squeamish about raw bacon….) You are a braver soul than many of us, apparently! I wonder, if you thought of the fish as something else, like a nice, fish-flavored chip (crisp? ), would it work out better? I have a similar thing about textures and the only way I can eat shellfish is by imagining it’s something entirely different than animal. Otherwise the texture is just awful! Chrome — I use butter. Margarine is foul. Isn’t margarine closer chemically to diesel than most other food stuffs…? It probably would help if I went at it again without thinking of it as fish. But you know, I think I’ll just keep that one in the realm of theory. No more dried fish or blubber for me. Don’t do it! Don’t eat the puffin. I will cry. Oh Wow Seb you are adorable in that picture. Glasses and beards get me every time. I rarely let my inner-dork shine through in photos but occasionally someone grabs a camera and I can’t stop them…! There will probably be some drunk photos of me turning up at some stage too.